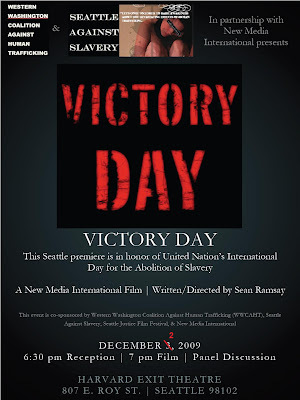 To celebrate the United Nation's International Day for the Abolition of Slavery, Seattle Against Slavery (SAS) is sponsoring this film's Seattle Premiere on Wednesday, Dec. 2nd at 6:30 pm at the Harvard Exit Theatre. In partnership with the writer/director/star filmmaker, Sean Ramsay, and Western Washington Coalition Against Human Trafficking, you and your friends are invited to attend this premiere. The price has been lowered to only $15 per person in order to get a great showing from the community for this human trafficking-political thriller. There will be appetizers at 6:30 pm, and you will get to meet the filmmaker, Sean Ramsay. The panel discussion will not only include your hosts, but also the U.S. Attorney, Ye-Ting Woo, who heads up the trafficking cases locally for the federal government. Please consider attending, purchasing your tickets early, and promoting for us.